Let’s start this 10-posts sequence by talking about FreeWebReport/Wysiwyg experience, that complement the FreeWebReport/Wizard and FreeWebReport/Explorer modules, that make FreeWebReport the most comprehensive and most playable interface in the WebReporting area. As usual, FreeWebReport makes intensive usage of FreeMetadata secured documents as data source. 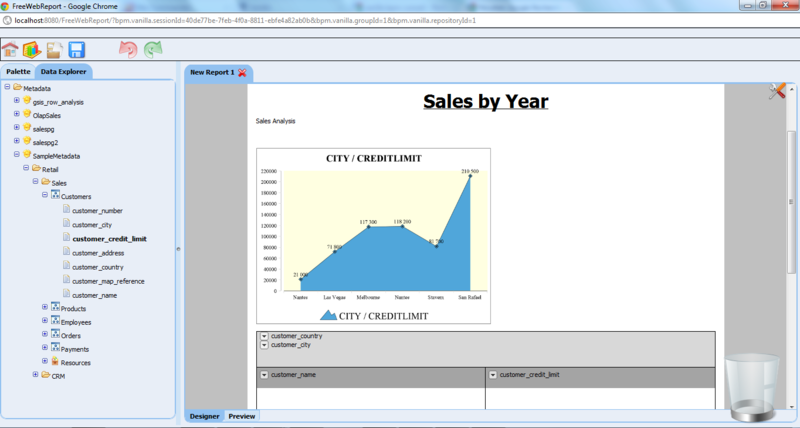 Its complete Wysiwyg interface allows user to design complexes reports, but also open/modify already existing reports. See below some screenshot and access to videos for FreeWebReport/Wysigyw features, its better than thousand lines of post. With Vanilla v3, we provide power users with an enhanced version of FreeWebReport, that support – in short – muti datasource (Metadata document), multi data set (dataset beeing link or not, based on context), a new set of layout (that is close from what is available in FreeDashboard) and additional graph & calculation formula. Your comments are welcome ! Thanks to Vanilla dev team, this feature – similar to Olap drill in FreeAnalysis – is now available in Vanilla 2.2 (using a FreeMetadata document that map a Sql database). You can find a simple video to introduce FWR/Explorer module. 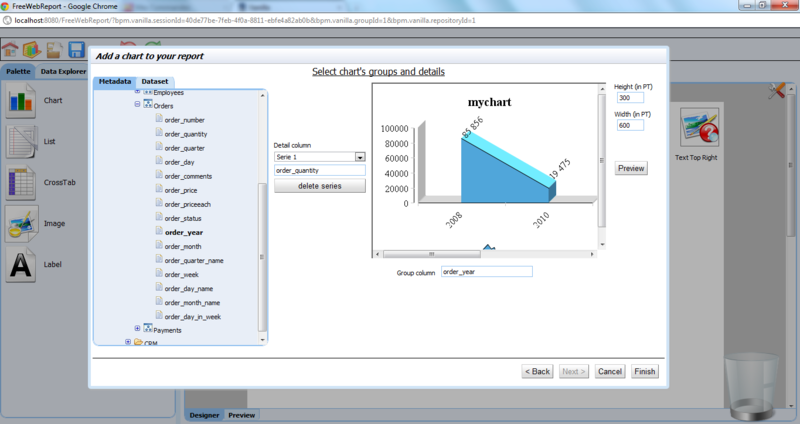 Views on Metadata document can be saved in Vanilla repository for later reuse, and there is a direct connexion with FWR/Report creation interface to arrange visual layout and saved a predefined report. For basic features of FreeWebReport / Report creation, I have also published another simple video.